North Jersey PT sponsored Patrick McKeown to come train North Jersey Physical Therapy therapists in the Buteyko Breathing Method. The method is aimed at reducing breathing to promote our bodies to be in a state of relaxation and equilibrium, and break the cycle of sympathetic overdrive or being in a state of constant “fight or flight.” It was created by a Russian physician, Dr. Konstantin Pavlovich Buteyko, around 1952. Because our systems are stuck “on,” many of us have the tendency to breathe too much (clinically known as chronic hyperventilation), which alters the level of the gases in the blood and leads to numerous problems. Some signs of dysfunctional breathing include mouth breathing, hearing breathing during rest, excessive sighing, frequent yawning, regular sniffling, and taking deep breaths before talking. Things that can lead to dysfunctional breathing include over eating, lack of exercise, excessive talking, stress, high temperature in the home, and asthma. Through a series of breathing exercises we are able to reset the respiratory centers in the brain and restore the normal balance to the system and allow the body to be in a parasympathetic state, or a state or relaxation and equilibrium. Through the Buteyko Breathing Method we are able to help patients change their pain levels and use it in conjunction with other treatment methods and modalities to address headaches, neck pain, jaw pain, low back pain, pain from fibromyalgia, as well as other forms of soft tissue pains. Call to schedule an appointment with a North Jersey Physical Therapy therapist today to see how we can help you decrease your pain and improve your quality of life. Breathing is unquestionably a key function of the human body. It sustains life by providing oxygen needed for metabolism and removing the by-product of these reactions, carbon dioxide. Breathing has other functions that affect motor control, postural stability and roles in maintaining homeostasis function (maintain internal stability such as balance and equilibrium) in the autonomic nervous system and circulatory system. When breathing becomes dysfunctional it affects people’s lives, challenging homeostasis, creating symptoms that most patients do not associate with their pain and compromising health. The primary muscles of breathing are the diaphragm, intercostals (muscles running between the ribs) and abdominals, which allow the average person to take over 21,000 breaths per day. These muscles are located in the chest wall compromised of the rib cage/thorax and the abdomen, creating an effective respiratory pump. The respiratory pump can become dysfunctional due to many factors, which are altered and paradoxical motion between rib cage and abdomen called paradoxical breathing, thus increasing use of upper body muscles such as the scalenes, upper trapezius and sternocleidomastoids. Abdominal weakness and rib cage stiffness are common dysfunctions that we see at North Jersey Physical Therapy Associates (NJPTA). At our clinic we evaluate and treat on how breathing affects postural stability and motor control. Muscles such as the diaphragm, transverse abdominals and pelvic floor muscles are important for motor control and postural support as well as for breathing. If their function is compromised there is an increased susceptibility to low back pain and injury. At NJPTA, we take a unique approach in treatment, which includes an extensive assessment and treatment using manual therapy interventions, neuromuscular exercises (90/90 Diaphragm breathing, Buteyko breathing) and dry needling. 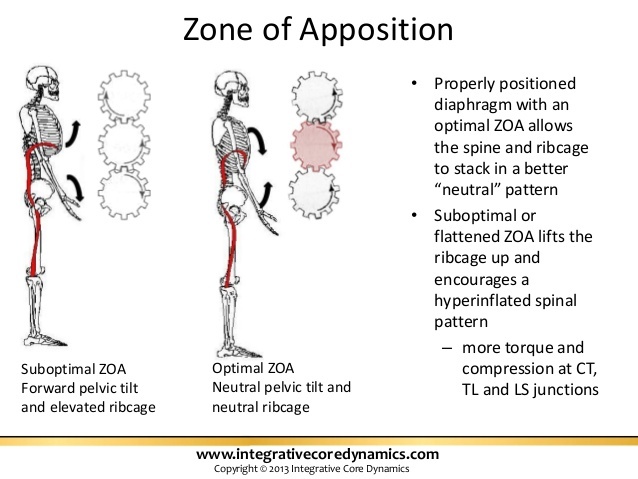 These are all helpful tools in restoring and maintaining motor control/postural stability. Feeling dizzy? It could be related to your neck muscles. Do you suffer from episodic dizziness? Myogenic (from muscles) dizziness is a common reversible condition that can be readily treated and once relieved sustained via key neck/eye and breathing exercises. This is a common but often missed/misdiagnosed condition involving your inner ear balance center (vestibular), vision and neck muscles that orient your head to gravity (head right reflexes). Our auto pilot brain (autonomic nervous system) is designed to keep us oriented to gravity. Our human instinctive brain is hard wired to have us survive. We have reflexes that are involuntary automatic responses to have us survive. Head righting reflexes keeps your head oriented to gravity (eyes horizontal, nose vertical). Our human brains are hard wired for this because we have to hold our head up and balance our body against gravity to survive independently in this world. This is so automatic that we are not aware that these reflexes are happening. Reflexes are NOT under our control. For example, try sneezing with your eyes open. Our human body is blind to gravity and many of these reflexes that we take for granted. Myogenic dizziness develops when the signals from our inner ear balance center (vestibular) signals from what we see and the neck muscles of how we hold our head up don’t match up in the brain. Neurologists, ENT’S and ophthalmologists’ are able to diagnose problems of the balance center (vestibular) and vision. The muscular component is not recognized. A trained physical therapist in head, neck and jaw (certified cervical temporomandibular therapist) is able to evaluate and treat this condition. Neck muscles are critical to auto pilot demands of head righting, balance, posture and breathing. Most people who develop this problem are not aware of these faulty habits. Onset can be fast (whiplash, falls and trauma) or gradual from head posture (working at a computer or aging). It can also be episodic related to stress and anxiety (clenching and breath holding). A physical therapist can quickly relieve the muscle contractures/trigger points within the muscle via dry needling, manual therapy and neuromuscular re-education and key exercises of the jaw, tongue, neck, eyes and breathing exercises. The patient is empowered by being given key exercises and self care strategies (I call it homework). This simple condition can resolve in as few as 4-6 visits. Long standing conditions >6 months may take longer to resolve. The key to sustained relief is the education and self trained awareness of postural breathing and orofacial (tongue, mouth and jaw) habits that are at the root of the problem. Most medical insurances cover these services if provided by a physical therapist.